Spring is definitely in the air! 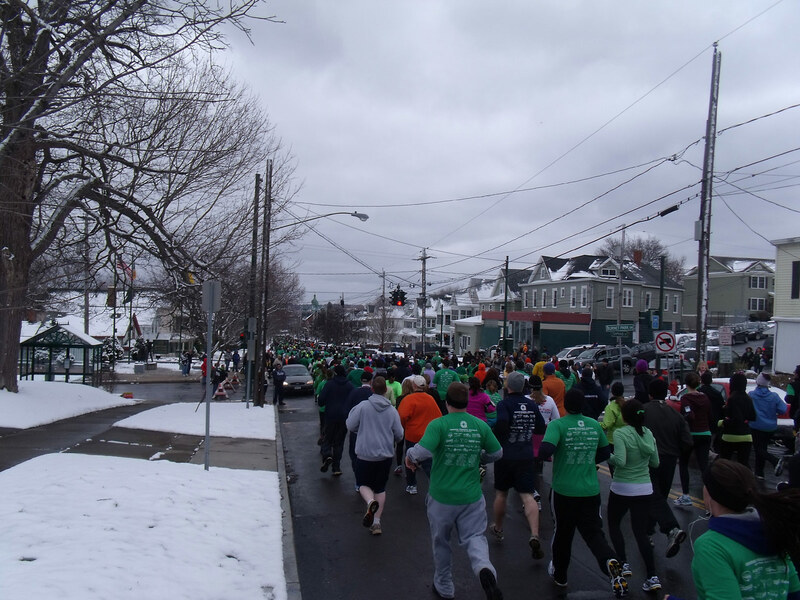 It would have been nice if it was even remotely in the air yesterday for the Shamrock Run. Despite it's absence, over 3500 showed up to run that hilly 4 miles with a temperature in the low 30's. It really is inspiring to be out there running around with people of all ages, shapes and sizes on a not so pretty March day. There are some pretty serious runners that finish the 4 miles in 20 minutes or so (I can't even imagine!) but there are a ton of people like myself who just do it for fun and to get a little exercise. I know for many people (and I'm not much different), running 4 hilly miles does not sound even a little fun. But you add the excitement of 3500 people, live bands around every corner, some pretty funny get ups on some of the runners and the prospect of a celebratory beer with your friends when it's all over, it's not so bad after all. 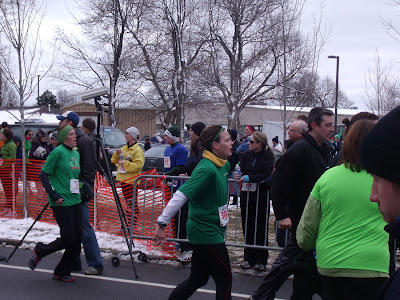 Last month I wrote a post, Mind Games , in which I explain my method of tricking myself into running by signing up for races that I should probably be able to complete when the day comes. It works for me. I've been hitting the streets as much as possible (weather permitting, I'm not a die hard) and I think it paid off. My time improved a tad this year but I felt SO much better during and after the race compared to last year. Don't get me wrong, I could think of nothing other than getting to the finish through the whole thing but I remembered along the way how I felt last year in some of those same spots. I remembered how pissed I was when I saw the 2 mile mark. Last year I thought "Are you bleep-ing kidding me??? Half way???". This year I was like "Oh nice, I'm half way there!". So here I am gasping for air at the finish (I'm the one with the green ear band and grey sleeves). You can see that I'm so committed to convincing people to add some activity to their lives that I'm willing to share this not so nice photo of myself. If you are thinking- "I'm too old to start", I guarantee there were people older than you there. If you are thinking- "I'm too out of shape", I'm willing to bet there were people of the same fitness level there. "I'm too out of shape" is an excuse that drives me mad. If you are a generally healthy person and plan ahead 3 months to do a race, and you work at it regularly you will be in better shape when that day comes and you will be able to finish a 5k. Start by trying to walk either 3 miles (if you have the time) or for 30 min and see how far you get. Try to beat your own time or distance each week or two. It will be so worth your while to try. Get a few friends to join you in the challenge, a little encouragement goes a long way. Here I am with my friends Martha and Deb. 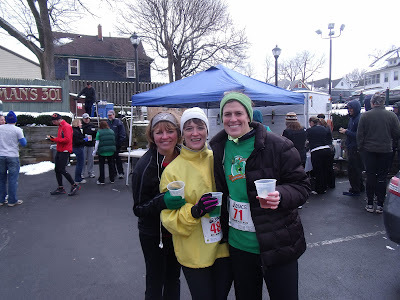 We've made it a tradition (this was the 2nd year for all of us) and we long the year when we aren't freezing our rumps off while toasting our accomplishment! Thanks for talking me into this one, it'll be a tradition for me, too. Congrats on beating last year's time!